Thai Beverage Group (ThaiBev) is one of thailand largest producers of alcoholic beverages. They own and distribute a significant brands like Chang beer and Mekhong and Sang Som rum (basically most of what I consumed while in Thailand). 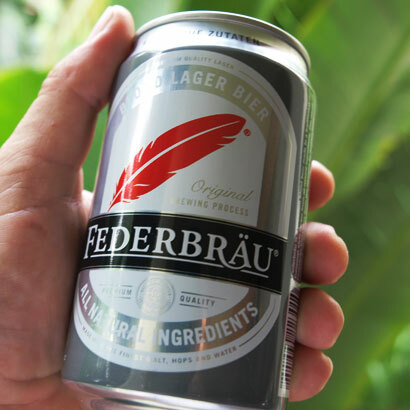 Since 2008 ThaiBev has also produced a premium beer called Federbräu. As is reflected in it's German name Federbräu is a mild German-style beer with 4.7% alcohol. Federbräu literally means feather brew in German, a reference to this beers lightness in alcohol and body. Prior to the launch of Federbräu, foreign imports like Heineken dominated Thailand's premium beer market. Thaibev sought to domestically produce a premium European style beer that could become an industry leader. Thailand that is certified by the prestigious German institutes VLB of Berlin and Weihenstephan of Munich as manufactured according to the strict German Purity Law; using only the finest natural ingredients, an exacting manufacturing process and fermentation method. Poured from a bottle the beer is clear light yellow colour with an average frothy white head. A The flavor is moderately light with sweet malty flavours alowg with some hoppy bitterness . The beer tastes like a slightly below average German lager. Federbräu is a decent attempt a German beer by a Thai brewer but overall if the prices were par I think I would opt for a Heineken. That being said Federbräu is a must try simply for being the only thai beer conforming to the Reinheitsgebot (purity law).